By Fight for the Future. Note: The battle for a free and open Internet that is equal to all as a public utility continues. The net neutrality movement will continue urging members of Congress to support the resolution under the Congressional Review Act to repeal the FCC rule overturning net neutrality. In addition, litigation is continuing to overturn the rule and strong issues are being raised so the court will remand the rule and order the FCC to reconsider. And, there are important net neutrality battles on the state level. You can take action at BattleForTheNet.com. On June 11, you’ll see no changes to your internet and think that the end of net neutrality is no big deal. The truth is, big cable and your Internet Service Providers (ISPs) will take their time to block, throttle and prevent you from accessing the internet anyway you want. The danger of the loss of a free and open internet is the end of the principles that made the engine the driver of free speech and innovation it is today. With ISPs able to pick winners and losers, we will slowly see the stifling of voices and small businesses unable to compete with established companies. Communities of color will lose access to the best medium they have to make their voices heard and share their stories without gatekeepers. Startups will face new barriers to reach customers as they have to pay more to not have their sites slowed down or blocked altogether. Representatives have the opportunity to put net neutrality protections in place, by signing the CRA discharge petition and voting block the FCC’s net neutrality repeal. Net neutrality is being stolen from you. And we have a warrant out for each and every House of Representatives member that has yet to sign to force a vote to reinstate net neutrality rules. Right now the Internet is dying because there are no net neutrality rules in place, but the fight is not over. Join the protest by sharing our wanted posters and using them as your social media avatar/profile pic. Let your representatives know that they are wanted and we want our net neutrality back. We’ve already won in the Senate, now we need to shine a spotlight on every member of the House of Representatives that has taken the free and open Internet from us by not signing the discharge petition that would have stopped the FCC’s repeal from going into effect tomorrow. With midterm elections coming up, lawmakers will be feeling vulnerable. This is the perfect moment to put pressure on House lawmakers. There is still time for Congress to overturn the FCC’s repeal and reinstate net neutrality rules through the Congressional Review Act (CRA). 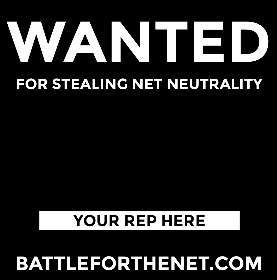 Change your social media avatars/profile pics and share our wanted posters to let your representatives know that they are wanted and we want our net neutrality back. If you haven’t yet, contact your representative. If you run a website, use our updated widget to let your users contact Congress without ever leaving your site. You can see a demo here. If you make videos, consider making a video about net neutrality, or use our simple video bumper to help spread the word. Always link back to BattleForTheNet.com whenever you can so your friends, followers, and users can easily contact their lawmakers. Now is the time to put our outrage and energy toward effective actions!